When it comes to running, no gear is as important as a pair of well cushioned, comfortable and supportive shoes. Unfortunately, many experienced runners dont replace them often enough, dont lace them properly, purchase the wrong size, or run with inadequate arch support. 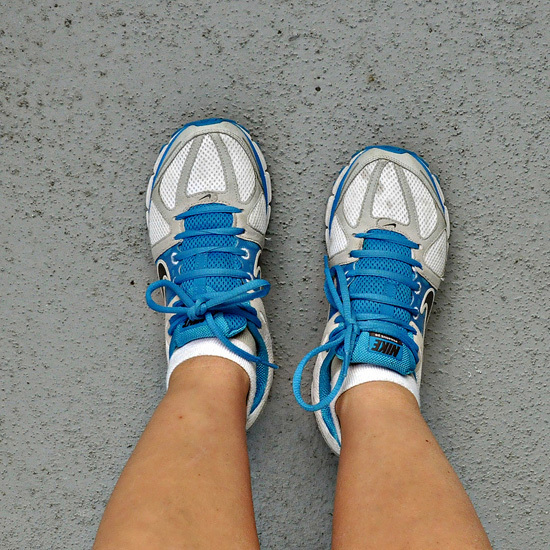 Heres how to evaluate whether or not its time for you to get a new pair of running shoes. Seems obvious, right? But if you purchase footwear designed for activities such as browsing used front end loaders rather than running, then chances are youre at a greater risk of injury and discomfort. That means your energy and strength will far outlast your footwear, making runs shorter. The point is, know your activity and wear footwear designed for that purpose. Many models that look like running shoes are actually designed for indoor gym classes. Popular group exercise classes such as Zumba and kickboxing feature side-to-side movements that require extra cushioning and support along the sides of the shoe, not the front and rear. As a result, when you buy your next pair of shoes, dont just choose the running shoe that looks like a running shoe—buy the shoe actually engineered for running. Do You Over-Pronate or Supinate? Over-pronation is an extreme inwards roll of the foot as the foot moves from foot-strike to toe push-off. Over Supination is just the opposite—when the degree of roll is inadequate. If you have neither of these conditions, chances are that you are a neutral runner. Why is knowing your individual biomechanical situation so important? Because different shoe models are designed to compensate for these conditions, reducing the chance of over-use injuries. 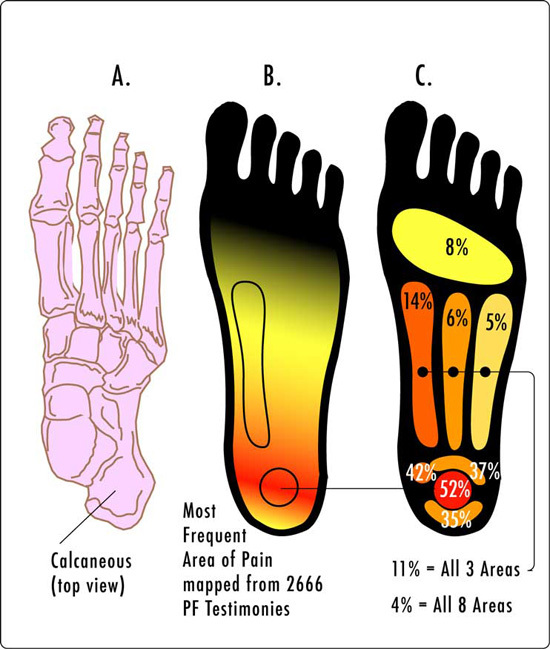 Poorly-fitting shoes are one cause for plantar fasciitis. The graphic above shows the most commonly-reported sites of pain. Fortunately there is a easy way to treat plantar fasciitis. Numbness is a similar condition but a bit more elusive. Youre running along fine. Youre not even tired, and youre at the 3.5-mile mark. Unfortunately, its happened again: your feet, inexplicably, go numb. Is it some kind of nerve or joint problem? Check with a podiatrist to be sure, but while youre waiting for your appointment, try loosening your laces. Dont have a podiatrist? Find one on Angie's List. Check out verified patient reviews now! As you run, your feet expand in size. Therefore, next time you lace up your trainers, tie them very loosely and see if it helps. If not, purchase one half-size up. Not sure what to do? Ask for a professional fitting at your local sporting goods store—don't forget to mention your numb feet. Another issue is just that your shoes are too narrow. Not all manufacturers are good about offering different widths. For a better selection, look to brand names like New Balance and Brooks. Serious runners, especially those who have trouble with joints, gait, or fallen arches, often choose custom-fitted orthotics. Orthotics, which mold to the precise contours of the foot, provide a level of comfort and support the average running shoe cannot. Beware, however, before you spend a few hundred bucks on custom made running shoes; most runners dont need them. The latest trend among runners in the know is specialty compression running socks that support the lower leg and improve circulation. It is the same concept that diabetics have known for a long time. Although the jury is officially still out on the effectiveness of such products, many pros swear by the socks and many sports doctors recommend them because they extend up the leg and over the calf to nearly the knee. In any event, dont forget to buy new socks often—even if they wont be the high-tech kind. Running with hole-filled socks (or no socks at all) not only increases discomfort during long runs, it also causes blisters and can make your shoes smellier. Quality shoes are key to running injury-free. Doing a warm-up routine never hurt anything either. Do you have any tips you would like to share? Please post them in the comment section below. Thanks!